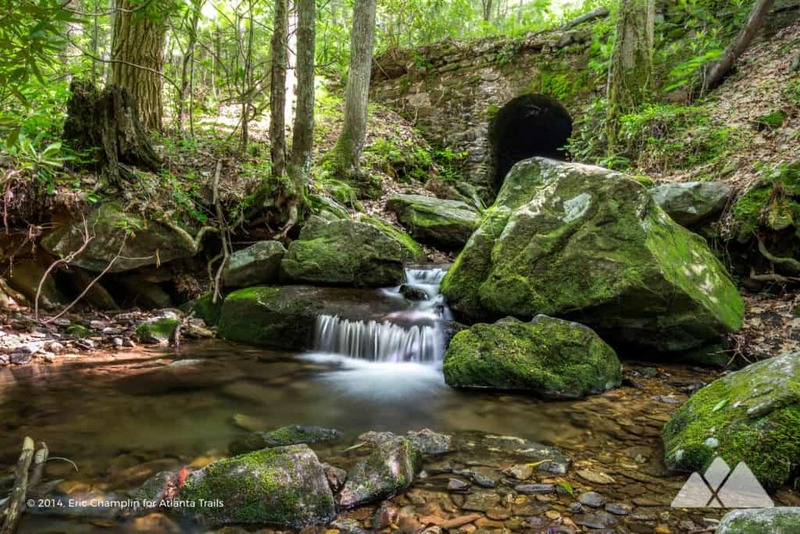 Hike the Byron Reece Trail at Neels Gap through a beautiful, mossy, stream-filled forest on the lower elevations of Blood Mountain. The Byron Reece Trail scales Blood Mountain’s lower elevations at Neels Gap, exploring a mossy, stream-filled forest. The trail’s beauty and its just-off-the-highway easy access makes it one of North Georgia’s most popular hikes. 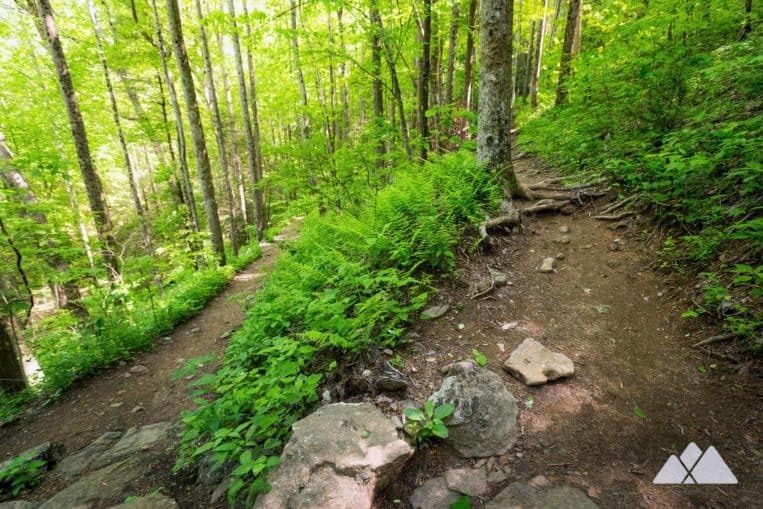 And while the trail is used by many to access trail to the nearby Appalachian Trail at Blood Mountain, it’s a beautiful trail worthy of a 1.35-mile out-and-back hike. At the trail’s end, the Byron Reece Trail offers a chance to set foot on the famed, 2000+ mile Appalachian Trail. The trail hikes through a lush forest in the shadow of Blood Mountain, the highest peak on the Appalachian Trail in Georgia. The adventure starts from the trail’s just-off-the-highway trailhead (view trail maps and driving directions), catching views of a small waterfall at the shady trailhead. The waterfall spills through a small ravine, tumbling over rounded boulders as Shanty Branch Creek exits an old, stone-piled bridge. The hike trails southwest from the trailhead, diving into the stunningly beautiful Blood Mountain Wilderness. 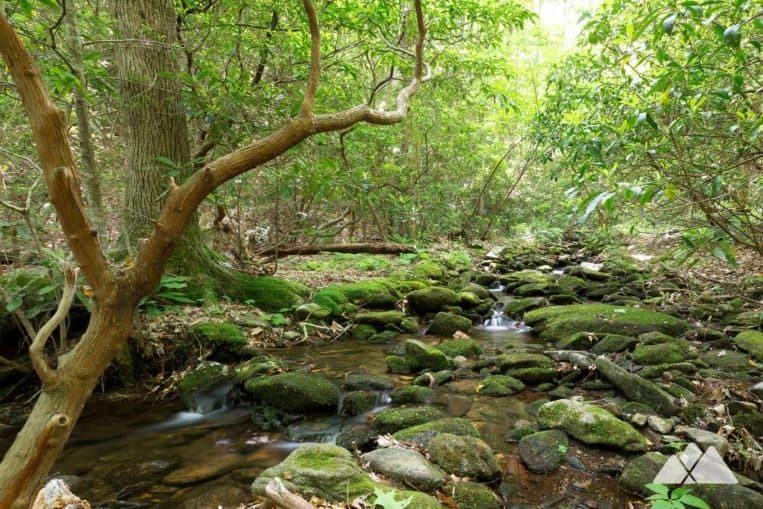 The route crosses a rocky, mossy stream at .1 mile, shaded by low-hanging, gnarled branches of rhododendron and mountain laurel. 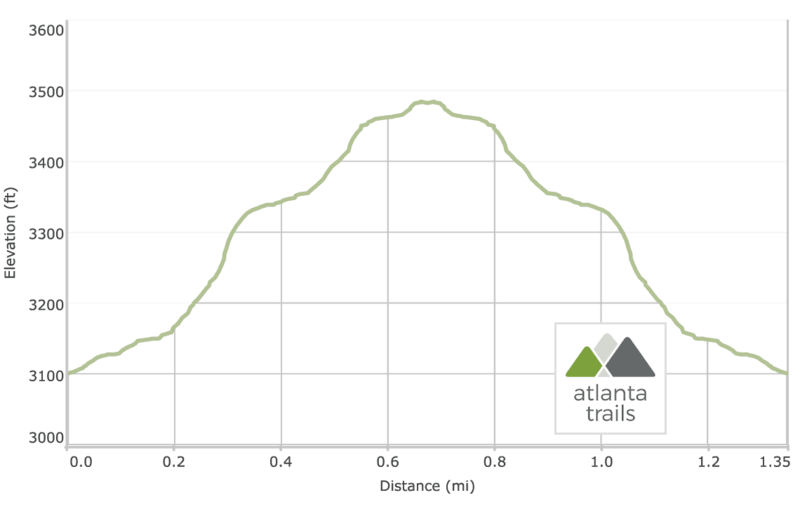 The trail begins to climb elevation, rising on Blood Mountain’s lower elevations. The trail enters a series of sharp trail switchbacks at .2 miles, gaining elevation in an increasingly rocky forest. Rough-hewn stone stairs and boulders line the trail bed as it switches back before leveling at .35 mile. Ferns dominate the cool, damp forest floor under a canopy of towering deciduous trees. The trail meanders through several broad switchbacks at .5 mile and crosses a small stream. 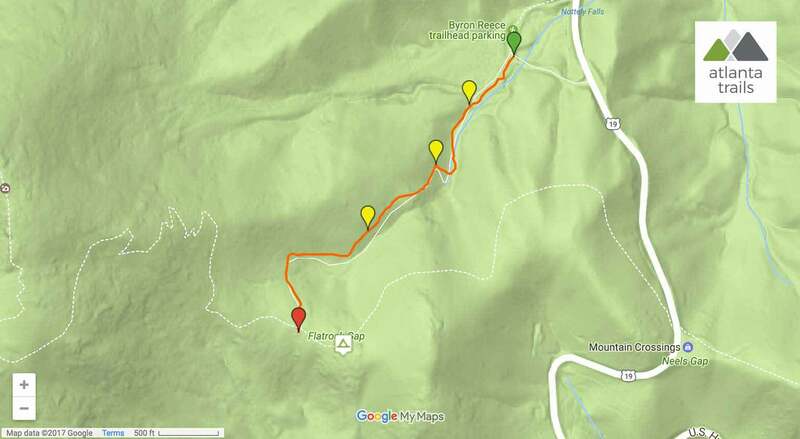 The Byron Reece Trail reaches Flatrock Gap and a four-way trail junction at .65 mile, the trail’s official end. Catch a view of the rolling Appalachian mountains from a clearing at Flatrock Gap, and loop back to the trailhead to complete the adventure at 1.35 miles. Up for some more Blood Mountain beauty? Hike west: The rectangular, white-blazed trail running east to west is the Appalachian Trail. A right turn on the Appalachian Trail hikes westbound to the Blood Mountain summit, visiting a 1920s stacked stone shelter built by the Civilian Conservation Corps at the Blood Mountain peak. Hike east: A left turn on the Appalachian Trail ventures eastbound toward Neels Gap, passing a balanced, flat rock outcrop and climbing to stunning views at the Wolf Laurel Top and Cowrock Mountain summits. Hike south: Straight ahead, the blue-blazed Freeman Trail circles the southern mid-slope of Blood Mountain, looping to meet the Appalachian Trail. Free (limited) parking is available at the Byron Reece trailhead.